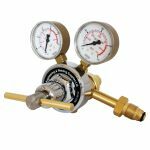 The Tech-Master GA 600 High Pressure / High Flow multi-stage regulator is a high performance product capable of the largest flowrate in its class. The multi-stage design ensures accurate pressure control through the life of the cylinder. This product is used in many processs control applications and is sutable for both cylinder and manifold mounting. Already a favourite in the diving industry, the Tech-Master GA 600 is used in a wide range of applictions from high pressure inflation of aircraft and racing car tyres to underwater cutting and diving gas control. Double stage with two gauges. Typical Application: Used where stable outlet pressure is required. Ideal for quality cutting applications, laboratory systems or precision machine cutting. Also ideal for heavy machine cutting, hand cutting and gouging.